, and extra reach is always good, so, the key question is: what effect does it have on image quality? There are many ways to compare, not the least of which being at various working distances – I use the 80-400 for everything from wannabe-macro at minimum focusing distance, to very close to literally infinity (i.e. astrophotography). I already know that, even without a teleconverter, it performs differently at different focusing distances. So keep in mind that in this post I’m comparing only one distance – infinity, roughly – and that results may vary significantly at other distances. My subject in this case is the almost-full moon. These photos were taken from Yosemite Valley, on a relatively clear but hot summer night. They’re not the best moon photos I’ve taken – heat haze was significant – but conditions were good enough to push what the 80-400 is capable of. And in particular, my ability to hand-hold. I’ve used a tripod several times in the past, but not found that it adds any noticeable sharpness – the VR in the 80-400 is exemplary, and the moon moves fast enough anyway that you can’t get away with shutter speeds below about 1/200 (at these focal lengths). The photos below were selected as the best samples out of twenty or so attempts, each. 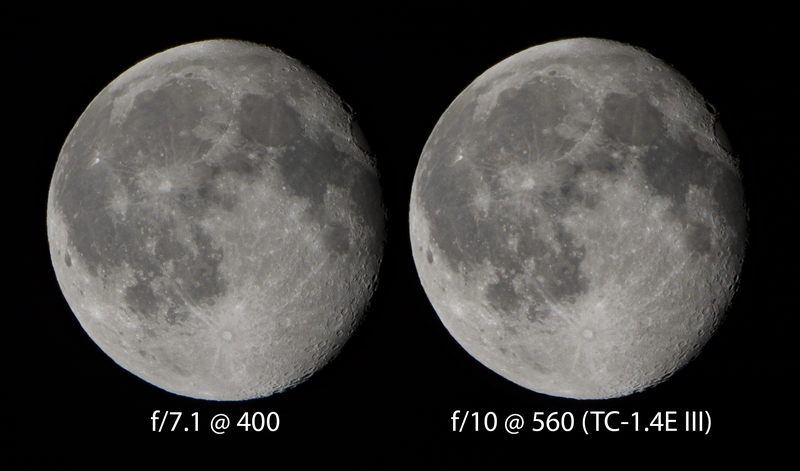 I tried various apertures to find the optimal one, with and without the teleconverter. I also varied shutter speed a bit, to see how low I could push it, though at 400mm best results came from 1/320, while 560mm was best at 1/500. Unsurprisingly the best aperture without the teleconverter is f/7.1 – this is optimal at all focal lengths and focus distances, for the 80-400 on a DX-format camera like the D7100 I was using. But it’s somewhat surprisingly f/10 with the teleconverter – surprising since that’s also 2/3rds of a stop down from wide open, whereas conventional wisdom with a teleconverter says that you need to stop down even further, relative to wide open, to find the optimal aperture. Presumably in this case diffraction, which normally comes into effect at f/8, is the limiting factor either way. This first comparison is made by opening the two images completely with default settings in ACR (Adobe Camera Raw), into Photoshop, where nothing more was done other than to compose them side-by-side. This of course meant shrinking the 560mm shot appropriately to match the sizes – a different comparison method might be to increase the size of the 400mm shot proportionately… but I trust reducing interpolation better than increasing, w.r.t. image quality – and personally I’d be more likely to use them at this size, as the 560mm at 100% original size is noticeably soft. The 400mm shot (no teleconverter) on the left was ISO 160, while the 560mm one on the right required ISO 560 for roughly the same exposure. Consequently, there’s noticeable noise in the 560mm shot whereas the 400mm is fairly clean. And the version below is after I tweaked the ACR settings to taste, to try to normalise the noise levels a bit, and to apply as much sharpening as I could subsequently get away with. ACR settings tuning is a black art, so I’m not in any way declaring that this is the best possible raw conversion. Sensitivity to sharpening artefacts is also highly subjective, as is sensitivity to noise, so consider that you might process these images very differently. If you do want to take your own crack at it, you can grab the NEFs from here and here. In my opinion, with default ACR settings, the teleconverter does actually add genuine detail. There is more noise, of course, but in a situation where you have more flexibility with shutter speed (i.e. to decrease it in order to keep ISO low), you will get better results. The tuned ACR settings show that otherwise, by default you can actually get slightly better results (IMHO) from the non-teleconverter image, since the higher ISO necessitated by the teleconverter adds noise which limits your sharpening options. Though it’s a very close call – in some parts of the image the teleconverter shot appears a little better nonetheless, though I caution that this could well just be the effect of shifting heat haze between the exposures. So, given this (and my other experience with this lens & teleconverter combo), will I continue using the teleconverter? Yes, though only when I genuinely need the extra reach or magnification – if I can otherwise fill the frame with interesting content, then I’d rather not use the teleconverter and instead crop in as necessary, which retains the option of not cropping and having other composition options. And how does the TC-1.4E III do on the 300mm f4 PF? That’s an evaluation for another time.